Our obsession with globalization's modern impact overlooks its deep roots in human history. “Globalization” is the 21st century’s favourite buzzword. It is part of our current zeitgeist: we are witnessing an unparalleled compression of time and space, as goods, services, people and information move more quickly than ever before. Yet, instead of being a modern-day concept, globalization has been around since the beginning. In recognition of the theme of the World Economic Forum Annual Meeting 2019 at Davos – Globalization 4.0: Shaping a Global Architecture in the Age of the Fourth Industrial Revolution – I'd like to turn back the pages of history and take a closer look at how human beings have travelled, migrated and traded through the ages. The obsession with globalization in its contemporary form has meant that the entire debate around it lacks awareness of its previous forms across time and space. This has led to the simplistic assumptions that globalization, firstly, entails the rise of the West and the fall of the East and, secondly, has been mainly driven by technology. Taking my lead from E.H. Carr, who described history as “an unending dialogue between past and present”, I will here attempt to reclaim the lost depth in the globalization narrative. 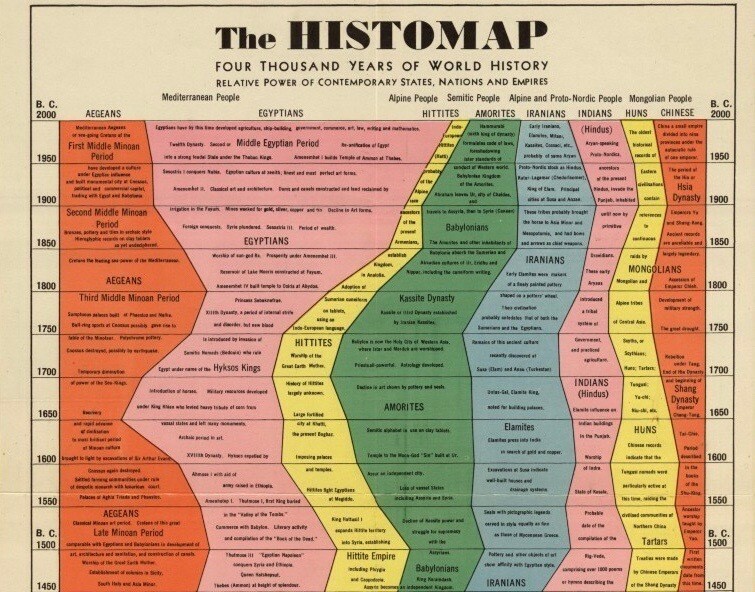 John B Sparks's famous 1931 Histomap reflects the conventional chronology of globalization by showing the power shifts between civilizations, beginning in 2000BC with the eastern powers – Egyptians, Hittites, Iranians, Indians and Chinese – and ending in AD1900 with the ascent of the western powers: the British Empire, continental Europeans, Asiatic powers, USA and USSR. Globalization is as old as mankind itself. Since the beginning of recorded time, key actors such as rulers, adventurers, traders and preachers have travelled in a bid to expand their political power, enhance their quality of life, proselytize their faiths or simply quenching the human thirst for curiosity. Through myriad encounters, interactions and clashes, they exchanged four key ingredients: people, ideas, commodities and capital. Through the lens of four globalization stories, we will deconstruct and decode the link between these different stakeholders and factors. 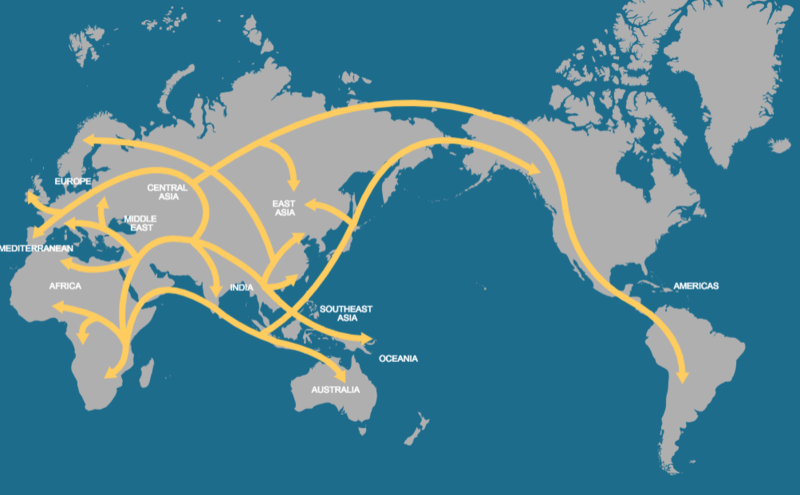 Human migration patterns over time, beginning in east Africa. Our DNA reflects our ancestral expeditions, beginning as early as when Homo sapiens first set foot outside the African continent. Almost every continent, over time, has become home to modern man in his search for better food, secure shelter and more land. This quest ultimately led to us to shift from foot to wheel, from open skies to roofs and from hunter-gatherer lifestyles to settled agricultural existences. In an unconquered and borderless world, sapiens explored the unexplored and charted the uncharted. Everything was trial and error, from discovering fire to inventing the wheel to creating written scripts. The coming of iron, in particular, was one of the biggest breakthroughs, as new geographies and demographies were colonized and domesticated. These string of “accidental forwards” – the cognitive, agricultural and written revolution – led to a series of events, simultaneous and subsequent, carrying humanity into the future. As cropping patterns diversified, agricultural surplus laid the foundation for the earliest civilizations of Mesopotamia and the Indus Valley, leading to the rise of cities, occupational specialists and social stratification. This historical narrative of mankind reflects our collective experience of primitive globalism. 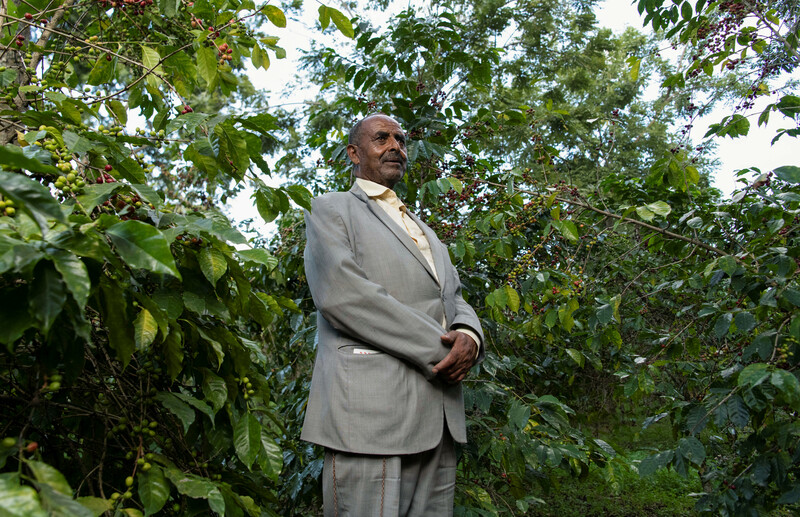 Yosef Lema, 72, stands at his coffee farm in the Sidama zone, Ethiopia. Sipping a cappuccino at Starbucks, little might Negasi, a 21-year-old Ethiopian-American student studying at New York University, know that the origins of coffee, a favourite drink of the civilized world, lie in his very own country. The world’s most cosmopolitan beverage, coffee has travelled through territories as diverse as South America, Europe, the Middle East and the Far East. Legend has it that it was first discovered by a Sufi goatherd, Kaldi, after some magic beans energized his goats. As word moved east, coffee reached the Arabian peninsula. With thousands of pilgrims visiting the holy city of Mecca each year from around the world, knowledge of the “wine of Araby” spread further. By the 17th century, coffee had made its way to Europe. Some reacted to this new beverage with suspicion, calling it the “bitter invention of Satan”. Nevertheless, it was so satisfying that Pope Clement VIII allegedly gave it papal approval in Venice. Coffee houses quickly became centres of social and political activity in major cities in England, Austria and France. In the mid 1600s, coffee was brought to New Amsterdam – later called New York by the British. Tea continued to be the favoured drink in the New World until 1773, when the colonists revolted against a heavy tax on tea imposed by King George III. The event, known as the Boston Tea Party, forever changed drinking preferences to coffee in the United States. By the end of the 18th century, new nations were established on coffee economies. Missionaries, travellers and colonists continued carrying coffee seeds to new lands. The commodity came full circle when the British brought back coffee as a plantation crop to its home country, Ethiopia. 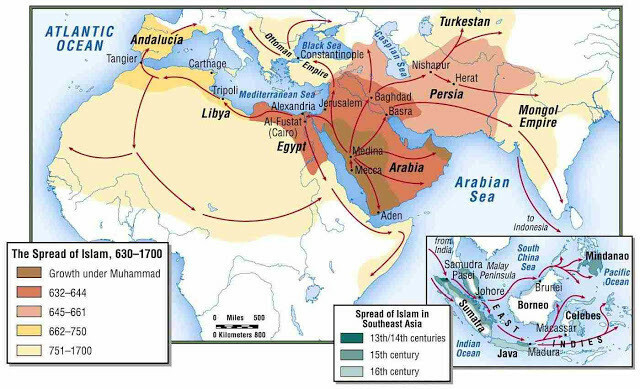 Map showing the spread of Islam. A third factor in discussing early globalization is the spread of religion. Over a period of a few hundred years, Islam expanded from its place of origin in the Arabian peninsula all the way to modern Spain in the West, and northern India in the East. Sometimes, it was carried in great caravans and sea vessels traversing vast trade networks on land and sea; at other times, it was transferred through military conquest and the work of missionaries. As Islamic ideas travelled along various trade and pilgrimage routes, they mingled with local cultures and took on new forms. As with all factors of globalization, their spread is attributed to multiple agents, not simply a monolithic driving force. Rulers doubled up as preachers and traders as missionaries. This has made Islam a religious and cultural force for 14 centuries. It is important to note the trajectory of Islam. The Rashidun caliphate, the reign of the first four caliphs, from AD632–661, is credited with the military expansion of the religion. However, significant cultural exchange and complex political institutions had not developed at this point. It was only during the Umayyad dynasty, AD661–750, that Islamic and Arabic culture began to truly spread. The medieval period was the era of the great Islamic empires. The Ottoman Empire in the Middle East emerged as a major military and political force by the 15th century. The other great dynasty overseeing remarkable artistic and architectural output was the Mughals. Founded by Babur, the Mughal dynasty ruled over the largest Islamic state in the history of the Indian subcontinent, from 1526 to 1858. This case exemplifies how all major world religions spread from a core origin area to new peripheral lands. This has ensured that even the remotest corners of the world have a mosque, church or temple now. 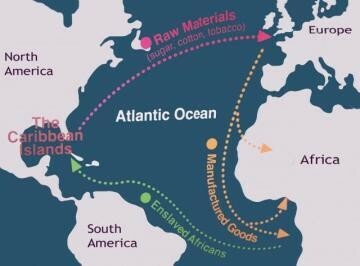 Map showing the British Empire's 'triangular trade'. Last but not least, we come to capital. The age of empires can be divided into old and new imperialism. The former refers to early expeditions undertaken by western nations between 1450 and 1750, undertaken for “God, gold and glory”, and focusing mainly on systems of trade. New or high imperialism, which came afterwards, was the search for fresh lands to conquer in the late 19th century. Britain’s colonies in Africa, Asia and South America provided neverending supplies of men, money and raw material for fuelling their domestic industries, and ready-made markets for their manufactured goods. It was no coincidence then that Britain’s industrial revolution occurred during its imperial expansion; they were two sides of the same coin. This “age of gadgets” was a result of myriad causes. Processes such as the Renaissance and scientific revolution provided the perfect setting domestically. Inventions by the Arabs and Chinese in the East – printing, gunpowder, porcelain, spinning machines, the compass, the stirrup and the blast furnace – were being perfected in the West. Nevertheless, there were three Cs – the discovery of coal, the creation of colonies and the production of cotton – that disproportionately tilted the geopolitical and economic balance towards the West. Rather than European exceptionalism, the events revolving around these three empowering Cs were pivotal for the British Empire’s primitive accumulation of capital. By weaving together a selection of globalization stories, this article has attempted to provide a peep into the history of the phenomenon. Each example is different in spirit or form. After all, history is, as the philosopher Paul Valéry once claimed, the science of what never happens twice. As we have seen, globalization has not merely been the flow of goods, capital, ideas and people from the “West” to the “rest”. Exchanges have always been a mutual and layered process. We must engage with how we, as humans, have become the first consciously globalized species. It is important for us to be aware of our cosmopolitan roots rather than identify with an insulated antecedent time. In the age of globalization 4.0, it is time to pause and rewind – in order to gain lessons from our past and guidance for our future. Vanshica Kant is currently with the United Nations in India. She has a master’s degree in global and imperial history from the University of Oxford and is a World Economic Forum Global Shaper.